Slumdog Millionaire: Enjoyable, but the storyline is marred by a number of clichés. Gran Torino: I liked this one. It did follow a pattern most viewers will be familiar with, but it was a good experience. Estômago: As far as food films go, this Brazilian piece is one of the better ones. Not as good as some of the Japanese ones like Tampopo, but still highly enjoyable despite a few minor flaws. 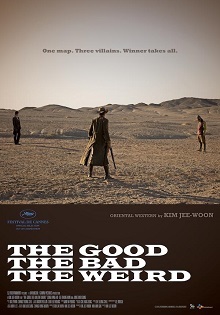 The Good, The Bad and The Weird: A very entertaining Korean “western” starring the magnificent Kang-Ho Song. The plot (find the treasure) is pretty bland, but the film itself is anything but, with a number of good set pieces, great scenery and a higher body count than I have seen in a good while. The budget of this film must have been extraordinarily low. After all, the star is Dino Strano (otherwise known as Dean Stratford), an extremely unattractive man who somehow manages to have women (who happen to be prostitutes) fall in love with him and marvel at his skills in the bedroom. They are also very supportive of his writing career, which just can’t seem to take off. Anyhow, one day he decides to kill his girlfriend’s pimp, and from there things go bad and he ends up getting beat up in a garage. So he buys two Magnum .38’s from a guy called “The Gypsy” who speaks with a strong southern Italian accent and . . . it’s time for revenge. One thing about this film that is noteworthy: the score, by Bruno Nicolai, is absolutely brilliant. The same can’t be said for the rest of the film, but at least it is entertaining, which is more than can be said for a lot of things. Here is a drawing my father, John Connell, did for the festive season. This is the second entry into the series, and begins with Oryu, the Red Peony Gambler, stationed before a bright red background, asking for our patience. We then descend into the usual story of gangsters and gambling, honour and love. The film is good though, with plenty of whirlwind knife-fighting, a bit of gun play, and some crazy humour by Tomisaburo Wakayama in his recurring role as Torakichi Kumasaka, the Chaplinesque yakuza boss. This is a slightly above-average spaghetti western by director Domenico Paolella, whose claim to fame is probably a series of sinful nun films he did in the early 70’s. Anyhow, the star of the show here is John Richardson, who plays a dual role as a pair of brothers. The plot isn’t important. Is what is important however is what makes this film good, and this has to do with a basket of ingredients: a great score by Coriolano Gori, excellenct camera work and film editing, and a rather original bandit gang leader, played by a very fat man, who tortures those he doesn’t like with leaches and a mace. Paul Leppin, Blaugast. A brilliant little novel. Very decadent. The translation offered by Twisted Spoon press, while not perfect, is very good. Highly recommended. Georges Rodenbach, The Bells of Bruges: Rodenbach is a very interesting author and Dedalus deserves a lot of credit for putting out this book which is full of the same sort of imagery used by Huysmans, though not firmly in the decadent school. The translation, by Mike Mitchell, is excellent. You are currently browsing the Oxygen blog archives for December, 2008.